Thomas Becket's consecration as Archbishop of Canterbury in 1162 marked the parting of the ways with his old master Henry II, even though he was chosen at the King's suggestion. The Archbishop placed the interests of the Church before those of the Crown and was assinated by followers of the King in Canterbury Cathedral in 1170. Becket was canonised and his tomb became a place of pilgrimage. The saint, wearing alb, chasuble and mitre, is seated on a throne in the centre of the panel, which is embattled along the lower edge. He raises his right hand, the first two fingers in a gesture of blessing. With his left hand he holds a cross-staff which is being presented to him by a mitred bishop, who wears a girded alb and cope and blesses with his right hand. A similar figure on the left of the panel places the mitre on the saint's head with his left hand, blessing with his right. 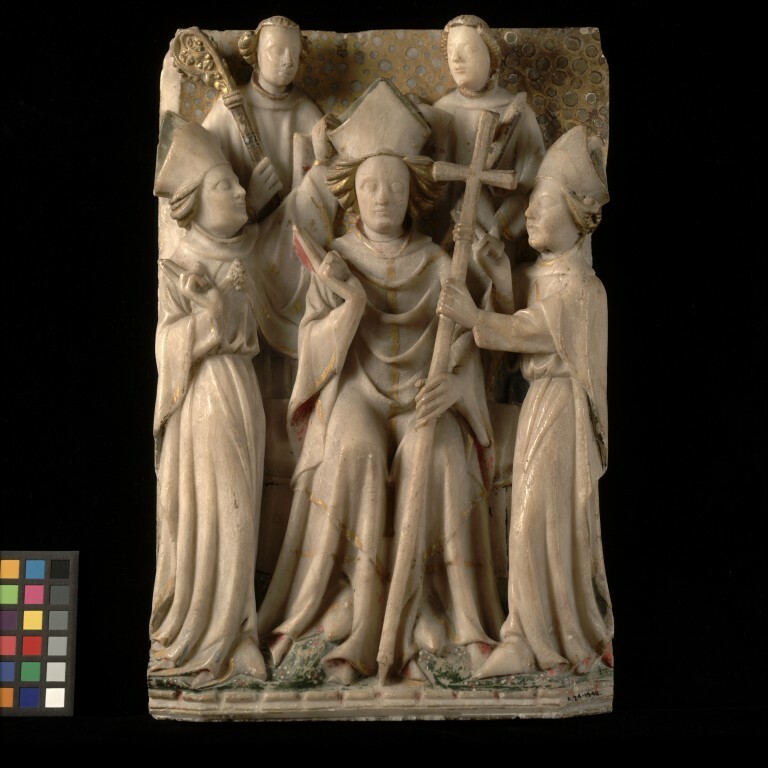 A cleric with a tonsured head stands behind the throne on the left at the back of the panel, carrying a crozier in his left hand and a book in his right. A similar figure stands on the right of the throne, the crozier in his left hand. The top of the crozier on the right-hand side of the panel is missing. The top right-hand corner of the panel has been restored with plaster. Green paint and the usual daisy pattern remain on the ground. Traces of gilt are on the edges of the garments, as well as on the hair of the figures and on the top of the crozier. Gilding remains on the background at the top of the panel with traces of gesso knobs. The restored top right-hand corner has been repainted in gilt. The back of the panel is marked with a cross with incidental additions. There are three lead-plugged holes. Acquired by Dr W. L. Hildburgh in Paris. On loan from him since 1921. Given by Dr Hildburgh in1946. Historical significance: Representations of a similar subject include one in the Leicester Museum, on loan from Mt. St. Bernard's Abbey, Coalville, and one which in 1967 was in the collection of M. Dumez-Onof, Mount Street, London. In these examples, the archbishop's cross-staff is replaced by a crozier. A Consecration panel and a panel showing St. Thomas Becket arriving at Sandwich were sold at Christie's in 1980; both are evidently by the same hand and from the same altarpiece, confirming that the consecration scene is of St. Thomas. Alabaster panel depicting the consecration of St Thomas Becket as archbishop. English, second half of 15th century. Hildburgh, W.L. Notes on some English Alabaster Carvings. Antiquaries Journal. I, 1921, p. 227, figs. 2, 3a. Victoria and Albert Museum. A Picture Book of English Alabaster Carvings, 1925, no. 20. Victoria and Albert Museum. English Medieval Art (exhibition catalogue), 1930, no. 594. Hildburgh, W.L. Studies in Medieval English Alabaster Carvings--I: Six Tables at Daroca;--II: A Table of the Holy Trinity. Journal of the British Archaeological Association. XVII, 1954, p. 11.